Acrylic balls are ideal for contact juggling. Machined and highly polished from optical quality material – free of internal distortions, and perfect for isolations. 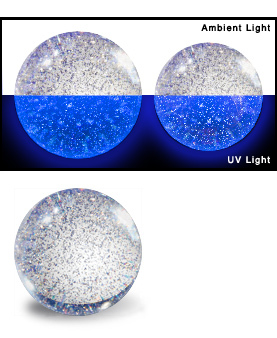 The Glitter UV has glitter embedded throughout the ball a sparkling effect. It also glows when activated by Black Light (UV). Tough, chip resistant and virtually shatterproof. Available in 2 sizes. We also carry Novus Fine Scratch Remover to polish out light scratches. #3530 2.50 in. Acrylic Ball - Glitter UV $31.00 ea. Cyrille Humen stops by our store for a little contact juggling, ball poi, mini bike and more. Pt 2 isolation tutorial plus routine from Vanden for seamless contact juggling using a Dubé Stage Ball. Pt 1 Isolation tutorial from Vanden for seamless contact juggling using a Dubé Stage Ball. Sergio Rojas' balls at the mall. A hip mix of juggling, ball bouncing, and contact. This video is for educational purposes. Performers may not be using Dubé Juggling Equipment.